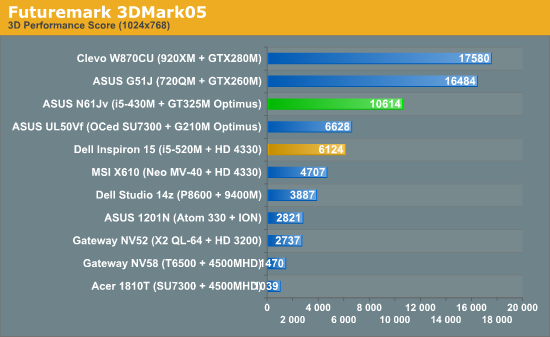 Before we get to the gaming tests, here's a look at theoretical graphics performance as measured by the various 3DMark iterations. With 48 SPs and 22GB/s of memory bandwidth, the GT325M is a big step up from most of the other GPUs. For these entry-level and midrange laptops and notebooks, the next closest competitor is the G210M-equipped ASUS UL50Vf, followed by the HD 4330 in the Inspiron 15. 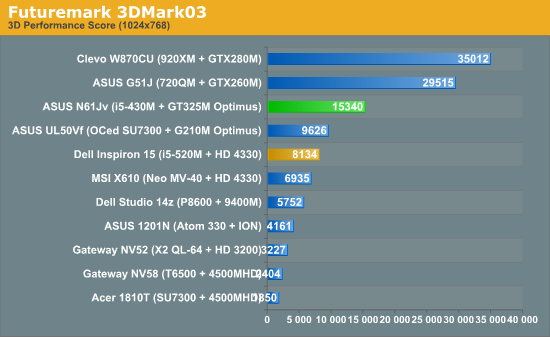 The GT325M has nearly three times the shader processing power of the G210M with over twice the memory bandwidth, so we should see a very large gap between the N61Jv and the rest of the competition (and let's not even discuss the old GMA 4500MHD performance). That said, the GTX 260M and 280M are likewise a big step up from the GT325M… but of course those GPUs don't support Optimus Technology. 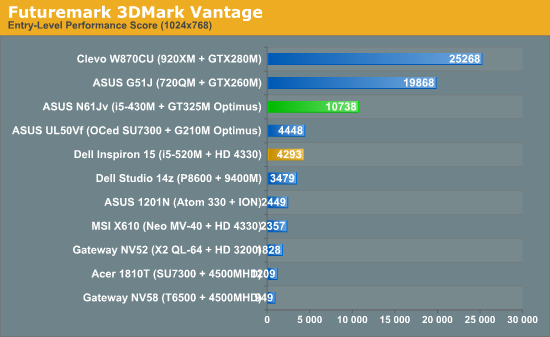 The lead over the HD 4330 ends up being 73% in 05, 84% in 06, 89% in 03, and a whopping 150% in 3DMark Vantage. Considering Vantage represents the state of the art in gaming a lot better than the earlier 3DMark tests, we expect Medium and High detail settings to correlate better with it rather than with the earlier 3DMark versions. Note that we tested at 1280x768 in 3DMark06 since none of these laptops support the default 1280x1024 setting without an external LCD; we also tested 3DMark Vantage at the "Entry" defaults (1024x768) since most of these laptops can't handle the "Performance" defaults—the N61Jv is a likely exception, though again it lacks support for the default 1280x1024 resolution. 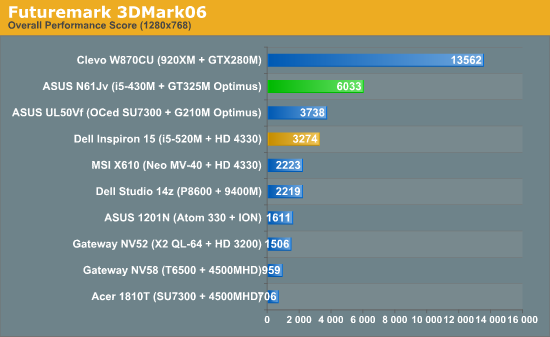 But enough about 3DMark; let's look at some actual gaming results. I do not understand why the hell Asus only hosts 1366x768 resolution lcds in their laptops. They have ONLY ONE laptop of full HD upto 16" screen size with a price of $1440 (approx) ! wtf ! In a 16" laptop what can be worst than this resolution lcd. "The worst aspect is the mediocre LCD panel, but when everyone uses lousy LCD panels (at least in sub-$1000 laptops and notebooks), we can only complain so much. The LCD panel and somewhat small battery capacity prevent us from giving the N61Jv our top Gold award...."
"Today, we're reviewing our second Optimus notebook, but while the chassis isn't any smaller—in fact, it's slightly larger with a 16.0" LCD"
Dear, At least I do not think that people buys a laptop ONLY TO GAME. The primary purpose of laptop should not be gaming. And If you will work with applications like visual studio, you can hardly see few lines of code with a 1366x768 resolution where the vertical resolution will taken up by application titlebar, menubar, various toolbars, status bar and finally OS's taskbar !!! Now understand how difficult it to work with such low resolution laptop. I'm sure that the only issue is cost. Many people will look at this computer at 900 dollars compared with 1200 for the one with higher resolution LCD and commensurate faster GPU and just buy the 900 dollar one. I refuse to buy products that don't have full Linux support. Linux support is much more important to me than a 10-15% difference in battery life. AFAIK an Optimus laptop should be considered a Win7 exclusive device, but confirmation would be nice; hopefully JW comes through. "Some of you asked about Linux support ... at present, NVIDIA is focusing on Win7 ... we're not even sure what would happen if you try to install Linux ... we're going to quickly check and post the results." I did actually test what happens with Optimus laptops and Linux. Even using an older 9.04 installation of Ubuntu, everything works as expected... which is to say, you can run Linux but you won't get the Optimus GPU. Since there's no direct connection of any display to the GPU, Optimus is required to move rendered content from the G210M to the GMA 4500MHD display buffer. As noted above, NVIDIA is currently focusing their efforts on making Optimus work on Windows 7; it's possible they will move to other OSes down the road, but they are not committed to doing so. If you want to run Linux and you want to use a discrete GPU, Optimus Technology won't work. Perhaps some skilled Linux community folks can figure out a way to do Optimus-like technology on their own, but given the level of detail required to interface with the GPU and IGP we see that as unlikely.